SAN ANTONIO - A Texas woman who for months was unable to qualify for food stamps pulled a gun in a state welfare office and held a seven-hour standoff with police that ended with her shooting her two children before killing herself, officials said Tuesday. The 10-year-old boy and 12-year-old girl remained in critical condition Tuesday. Authorities identified the mother as Rachelle Grimmer, 38, and children Ramie and Timothy. 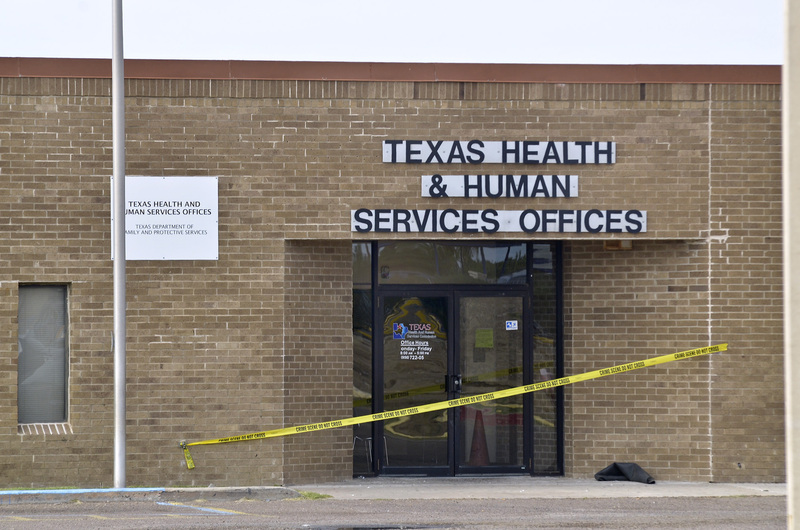 When the family entered the office on Monday shortly before it closed, Grimmer asked to speak to a new caseworker, and not the one whom she worked with before, Texas Department of Health and Human Services spokeswoman Stephanie Goodman said. Grimmer was taken to a private room to discuss her case, then she revealed a gun and the standoff began, Goodman said. Police negotiators stayed on the phone with Grimmer throughout the evening, but she kept hanging up, Laredo police investigator Joe Baeza said. She allegedly told negotiators about a litany of complaints against state and federal government agencies. Grimmer let a supervisor go unharmed around 7:45 but stayed inside the office with her children. After hanging up the phone around 11:45, police heard three shots, and a riot police team entered the building. Inside, they found Grimmer's body and her two wounded children. The children were "very critical" and unconscious, Baeza said. Goodman said it's not unusual for caseworkers to confront angry or confused benefit-seekers, but that it's very rare for a situation to escalate to violence. Baeza said Grimmer had recently moved to the border city from Ohio. Grimmer first applied for food stamps in July but was denied because she didn't turn in enough information, Goodman said. She said it wasn't immediately clear what information was missing. "We were still waiting, and if we had that, I don't know if she would still qualify or not," Goodman said. Goodman didn't know whether Grimmer had a job, or whether her children were covered under Medicaid or the state children's health insurance program. The family's move from Ohio may have complicated Grimmer's application if the family had no Texas records the agency could check electronically, Goodman said. State welfare offices have come under scrutiny in the past for being overburdened, but Goodman said the agency has made significant progress in the past three years. She said wait times are shorter, and that Grimmer was scheduled for her initial interview just one day after applying. Grimmer didn't make the appointment, she said.